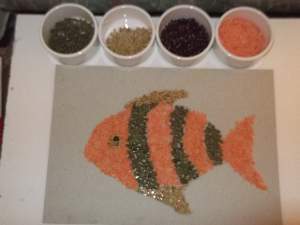 Have you tried seed art yet? Look at this fish mosaic! It`s made from lentils. It would make a great framed picture for the kitchen wall. You don`t need to use the lentils and beans I have used. Any seeds you like will do. In fact, the more you diverse the more interesting pictures will be created. But let`s work with these lentils and beans to learn how to do it. Ingredients For Your Mosiac Not Your Soup! 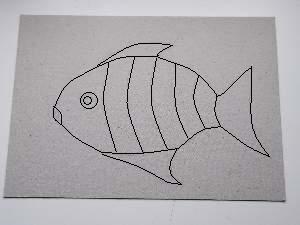 Draw a penciled outline of a fish or some other simple-shaped creature. 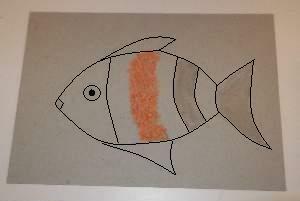 I have drawn a striped fish for my mosaic so that I can fill in the stripes with contrasting seeds. Do not paste glue all over your picture but work in sections. With this kind of seed art you need to be liberal with the glue so the seeds stick. Take the lentils after applying glue to one section and sprinkle them over it. Pile them on so you don`t end up with too many gaps. Take your hand and press lightly onto the lentils to help them stick. Now turn your picture up and tap the back of the card. The loose lentils will fall off leaving you with a covered section. Use a sheet of paper to catch the excess. Repeat this on all the sections that you want to be covered with red (really orange) lentils. After you finish with these parts you can move on to the contrasting seeds. I have used dark olive-green colored Mung beans for the other stripes. Some light beige Coriander seeds for the fins and eyes, and a dark red Aduki bean for the eye pupil. If you have spaces showing between the contrasting colors, glue into place individual seeds by pushing them where they fit in. For my mosaic background I have pasted dark blue and green strips of cellophane to give it a watery deep look. Pasting them can be a bit of a sticky business, but you will soon get the hang of it. 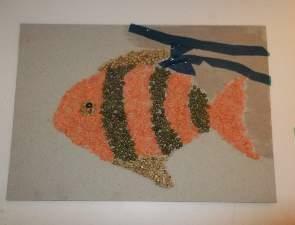 Push the cellophane close to the seeds around the fish edge with your paste brush to fill in any gaps. 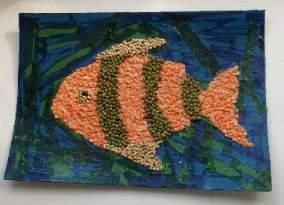 Paste a glaze over the entire seed art to seal it and make it look nice. Your fish is ready to be framed and hung. See more nature crafts to do during the 4 seasons.